This entry was posted on Saturday, September 10th, 2011 at 11:19 and is filed under 3a) News and Comments, 3c) Falsification tests. You can follow any responses to this entry through the RSS 2.0 feed. You can leave a response, or trackback from your own site. Excellent news, a way forward for the Svensmark hypothesis over land masses. This must really confound how the climate models “calculate” condensation rates. I seem to remember that NASA can not predict solar cycles too well…. but how big a part? Is it “controlling”, large, or insignificant? Is it a variable of just weather rather than climate? Also, how does the effect vary (in overall importance to the whole climate system) over time, in relation particularly to the 11 and 22 year solar cycles? NB – Please, Nigel, I am not political, except in the commonly left wing interpretation that “everything” is political. I find a lot of the people who try to demean what I try to discuss, or argue and use debating tactics against me, as usually happens elsewhere, are however. That does not make me political per-se I hope, more of a “target” for those that are politically motivated. No comment yet from Wolfendale or Sloan? Anybody interested in finding and looking through 30+ years’ worth of global weather satellite images to reconstruct cloud cover data? Agricultural research stations may also have historical data on insolation near ground level onto a horizontal surface. When adjusted for solar time of day, it can provide an indication of atmospheric “transparency” during the day. Insolation data would be valuable for checking how sensible one’s guesses are of the effect of clouds seen in corresponding satellite images. If used for “calibration” of albedo models, they no longer provide a sensible validation of albedo as they cannot possibly falsify. Hi Nigel, as to the explanation of 911 issue, how do you think of this point of view? I am not sure whether it is for or against Svensmark hypothesis. 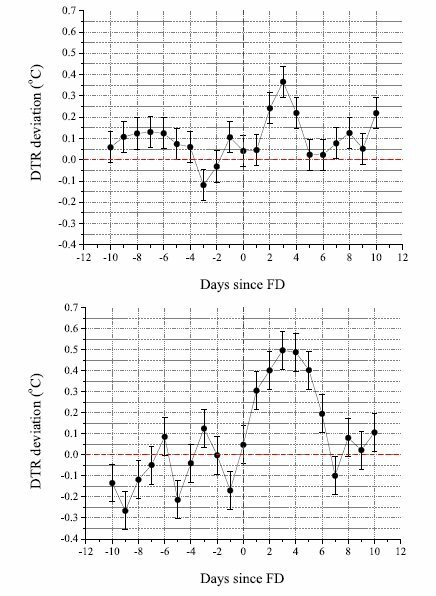 Hong, G., P. Yang, P. Minnis, Y. X. Hu, and G. North (2008), Do contrails significantly reduce daily temperature range?, Geophys. Res. Lett., 35, L23815, doi:10.1029/2008GL036108. A free copy of the Hong et al. (2008) paper. It doesn’t really matter what the reason was, for the post-9/11 increase in DTR, as long as everyone accepts that a loss of cloud was involved. The lifelong journalist in me couldn’t resist the 9/11 connection, alhough being vaguely aware of latter discussions I did insert “apparently” into the contrail story. So what happened was that a particular pattern of air masses just occurred, that was associated with very little cloudiness in general. The lack of contrails was essentially coincidental. I’ve been waiting at this bus stop for months, waiting for the ‘Whoosh- not missing just busy’ bus to arrive. Not cancelled I hope? Thank you for your patience, Richard. No cancellation, but unexpected delays for both scientific and personal reasons. Sooner or later the ‘bus’ will arrive, in one form or another, and I believe it’s worth the wait. Meanwhile I’ve tried to keep abreast of the main Svensmark-related news. There is an interesting discussion of clouds/albedo and their impact on climate going on over at Tallbloke’s Talkshop. Nigel, Judith Curry has a post which will interest you. Most interesting and encouraging. Thankyou. very interesting, I remember reading an article about jet contrails and how they help ‘seed’ clouds and can make it rain more then nature intended!